So neither the one who plants counts for anything, nor the one who waters, but God who causes the growth (1 Cor. 3:7 NET). She asked me if I loved Jesus, and I said yes. Then she began crying, and told me Paul is her brother who has been addicted to drugs for many years. The woman said the Lord gave her this plan to start a prayer campaign for Paul, but she had no money for signs, so she started a “Pray for Paul” Facebook page first. As a result, some donations came in to pay for the signs. Also, prayer requests and signs began circulating for others like Paul. That happened two Novembers ago. 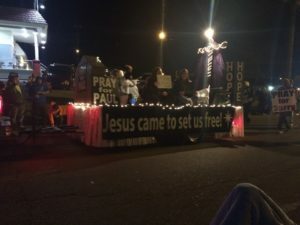 Two months ago, a “Pray for Paul” float was part of Cleveland’s 2016 Christmas parade. Besides Paul, the float featured signs asking prayer for Barry, Drew, and others. This woman’s campaign for her brother (which has grown to include 200 others) reminds me of Jesus’ teaching that we “should always pray and not lose heart” (Luke 18:1 NET). Especially, we should keep praying for the salvation of lost people. In the parable of the sower, Jesus describes three types of people who need salvation. Each of them hear the Word of God, which is able to produce saving faith (Rom. 10:17), yet none of them are serving God. They are the indifferent, the shallow, and the prodigal. The indifferent individual hears the Word but “doesn’t take it in, it just remains on the surface, and so the Evil One comes along and plucks it right out of that person’s heart” (Matt. 13:19 TM). This could be your son or daughter, your grandchild, or your childhood friend who was brought up in church, hearing the Bible stories and learning Bible verses. Yet, he or she has never come to faith in Christ and is indifferent to the things of God. Here’s hope for the indifferent: “The Lord . . . does not wish for any to perish, but for all to come to repentance” (2 Peter 3:9 NET). The shallow person hears the Gospel and responds to it enthusiastically, but “when the emotions wear off and some difficulty arrives, there is nothing to show for it” (Matt. 13:21 TM). He or she may have responded to a Sunday-morning altar call, made a promise to God at a youth retreat, or said a prayer at a Christian concert. However, this person is now trying to fill the spiritual void through another means—perhaps a different religion, an alternative lifestyle, or an addiction— rather than following Christ. Here’s hope for the shallow: The Lord says, “Be earnest and repent! Listen! I am standing at the door and knocking!” (Rev. 3:19-20 NET). The prodigal hears the Word, but it gets choked out by “worldly cares and the seductiveness of wealth” (Matt. 13:22 NET). The apostle Paul had such a friend, named Demas, who abandoned him and the ministry, “having loved this present world” (2 Tim. 4:10). Here’s hope for the prodigal: The Lord said to unfaithful Israel, “Return, O backsliding children . . . for I am married to you” (Jer. 3:14 NKJV). Prodigals have broken their covenant with God, but He still reaches out to them with love. He longs to restore the relationship. Then there’s a fourth group of lost people, unmentioned in Christ’s sower parable because God’s Word has never been sown into their lives—they have never heard the Gospel. Let’s call them the unaware. Most of them live in faraway nations, yet some of them live in your community and mine. They might be immigrants who own a business, agricultural workers, or university students. Also among the unaware are lifelong Americans who have never heard the good news. Imagine: You and I could sow the Word of God into the lives of people who don’t even know they are lost. Meanwhile, we must continue being “waterers” to our indifferent, shallow, and prodigal friends and loved ones. “So neither the one who plants counts for anything, nor the one who waters, but God who causes the growth” (1 Cor. 3:7 NET).